This week we head to southeastern Massachusetts to meet with Mitch Mitchell a top 3 finalist in Season 1 of Alone. It was a cold day hanging out with Mitch at his camp. Hanging out under the parachute shelter with a fire-pit going for food and brew helped tremendously. Mitch is both running a vendor booth and is giving some talks and workshops at the New England Bushcraft Show, I hope you enjoy the videos we made for the latest edition of #walkaboutwednesdays. In part 1, Mitch shares what Bushcraft means to him. 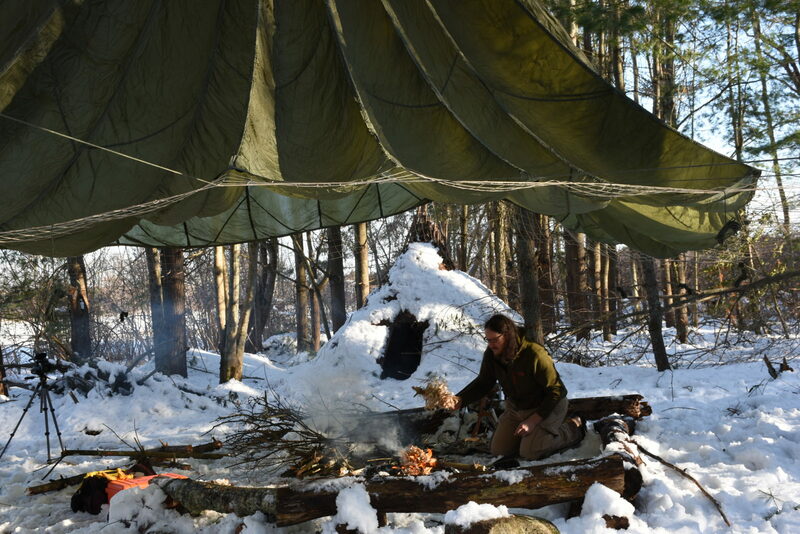 In part 2, Mitch discusses his survival school and the bushcraft gear he sells. In part 3, Mitch discusses the workshops on celestial navigation, one of the things he’ll be doing at the New England Bushcraft Show in April. Marcus: Hey, everybody. Marcus here with the New England Bushcraft show. Today I’m meeting up with Mitch Mitchell from Native Survival. Marcus: Mitch is one of the finalists from season one of the Alone TV show for the History Channel. You might have recognized him there. He’s also got a phenomenal YouTube channel, and the Native Survival brand here is really well known in in this part of the Northeast. Mitchell, I’m really glad that we were able to meet up. Thank you for inviting me to your camp. Mitchell: Yes. Thanks for coming. Marcus: I’m interviewing the people that are participating in the show. I’d be really interested to know from your perspective what got you into bushcraft? What does bushcraft mean to you? Mitchell: To understand bushcraft is to understand the natural world. I really can’t imagine a better science other than bushcraft. How’d I get into bushcraft? I got into bushcraft because my grandfather still knew some of the the old ways that were handed down through my people’s time. I was a little kid, he used to fish with a throwline kit. He was a very clever man. He used to fish with a throwline kit, coming to how to use mud for medicine, things like that. Take out stingers. It was great, man. I still have his fishing kit. His little kitty hat. It was great. He would sit down. He was so just absolutely calm. It was like he showed up like he was stalking when he showed up to the water line. He’s not making noise. He was just all of a sudden– It’s like something came over him. He’s quiet, sit down, set up his rig. He’d be in the water before me and my dad have our poles ready. We’re still trying to get things together, he’s already fishing. He always have a joke, like, “You’re never going to catch a fish” once in a while when he had the lines in the water. He really instilled a lot just by watching him. He get a little belt he tied off to his chair. He just sit there and he have a cup of coffee. He starts getting a bite. He’s fished the bottom. Never used bobbers. That was like a circus to him. He would already look at me and stop, bringing in something crazy. You know, bass or eel. His favorite things eels. They gave up great fights. Bushcraft was introduced to me when I was really small. I didn’t really realize it was bushcraft. It’s we’re just hanging out in the woods with my family. When I got older, I realized that watching how they built fires, watching how they fished was a thing. People would study that. When it was like I had to go back and think about– Because I just knew it. Then, because the native population is gone over here, I had to then teach myself. My grandfather was gone, I had moved out and all that. I had a ton of skills, but not like now. I had to basically teach myself and go look at the old ways. Not only through memory, but then learn from guys that I could find in books. You being from Britain, a big guy for me was Remus. I mean that guy just knows a lot. What really kicked me off was after my grandfather passed away, I joined the Boy Scouts, and Baden-Powell’s when it started. Daniel Beard ran the American branch. I joined the Boy Scouts because I still needed that even though my grandfather was gone. Then eventually evolved into me learning about Ray Mears, becoming older and going out camping with my father. Once I found out Ray Mears, I started learning all his books and Mors Kochanski’s book. All this stuff just blew up. It just blew up for me. I just expanded from that. Marcus: It’s really cool that your grandfather, the heritage, and the family was what motivated you and kind of peaked your early interest as a child, then that escalated throughout your adult life. Mitchell: Exactly. I got away from it. I became a professional musician. I stopped going to the woods for maybe three, four years, something like that. Then that’s when I found Ray, Mors Kochanski, and all these people. They reinvigorated, they gave me stuff that I need. Man, I’ve wished my grandfather wrote a book. I latched onto all this knowledge, and I’ve just been going ever since. Marcus: Cool. Thanks, Mitch. We’re going to continue with a campfire chat. We’re cooking up some lunch, having a brew. Join us in a few more minutes. We’ll come back with a bit more of a Q&A with Mitch Mitchell from Native Survival. Mitchell: Catch you guys later. Marcus: Hey everybody. Marcus here with the New England Bushcraft show. We’ve just got our lunch on the fire. I’d like to bring the conversation back over to Mitch. Mitch tell me a little bit more about native survival. What is it that you guys do? Mitch Mitchell: Sure. Native Survival School, we do day classes. We do week-long classes. We have a website where we sell gear that I have designed. Marcus: What is the website? Mitch: Native Survival dot com. That is a direct link to my Etsy store. That’s the venue I choose to sell our gear. I design all my own gear. Wool blankets, knives, things of that nature. Flint steel kits, trapping kits, snare kits. I curve spoons. That gives me my venue to sell various things that I have designed because I like to design my own gear because I’m very particular about gear. It’s hard for me to find exactly what I need. My little blanket, to give you a quick example, my wool blanket I designed to have Velcro on the bottom and along the side of the blanket. Not only just a blanket but I can completely seal it. Now it’s a bivy or a sleeping bag in the summer. Now as a bivy, it’s a fire proof, well fire resistant bivy because I can take my sleeping bag, throw it inside there and I lay down next to the fire. Now in Amber’s land and it would normally burn a hole into my sleeping bag. Whether it be cotton and feather. Whether it be nylon. Now it doesn’t . Now just lands on the wool blanket. It adds extra insulative value. You know what I mean? I never find a wool blanket that could turn into a sleeping bag like that or a bivy. I had to design it. That’s what happens. My knife has a Poopa design that’s candy four inch blade. Very Scandinavian style blade but the handle is actually very European because it has the classic coke bottle design. I never found what I needed for that. I never found a handle long enough for chest lever that will get in my palm. I started putting all these things that I needed in a knife that didn’t exist. If it existed, I would have bought it. It didn’t exist but now it does. That’s one thing we do. We do classes. The other thing is the items. Right? That’s two things. I have a blog as well. Every once in a great while, I’ll throw something on there. I’ve written articles for magazines, Self Reliance Illustrated. Sometimes I write. An editor contacted me. We are talking about possibly doing a book deal maybe. Maybe a couple of years to do that. That’s what Native Survival is . It’s a store, it’s a school and that I have various media that I also release. The biggest media I release is video. My YouTube channel is pretty much every week. Two times a week I release a video. Sometimes they are heavily instruction where I go over a task. Go over sometimes it’s camp outs. Day trips, weekend trips, whatever it is, longer trips. Sometimes in a group setting, sometimes not. Just me alone. That’s a gambit of what Native Survival is. Marcus: Cool. Awesome. Mitch is going to be joining us at the New England Bushcraft show. He’s going to be a vendor there with his products of sale. He’s also going to be an instructor giving a class. In the next segment, when you come back, we’ll tell you about the class that he’ll be and the workshops and talks he’ll be doing at the New England Bushcraft show. Marcus Gay: Hey everybody. Marcus here with the New England Bushcraft show. It looks like our lunch is almost ready, but I want to have a little bit of a conversation with Mitch to learn and have him share with you what he’s going to be doing at the New England Bushcraft show. So Mitch, why don’t you tell us what you’ll be doing. Mitch Mitchel: Sure. I’m going to be teaching celestial navigation or navigating by the stars. Now, I’m going to go over several ways to do this. I’m going to go over how to find Polaris in the sky by using constellations, kind of a macro view. I’m also going show how to use the LURD technique, and that is not even using groupings of stars, if you just see a star and depending on what way it moves, L-U-R-D, left, up, right or down, you can understand which way you’re looking there as well. I plan on talking multiple ways on how to find constellations, how to find Polaris, how it all works. On the fly, just sitting down for a couple minutes looking at a star, you can not only just get general direction, but also I’m going to go into how to shoot an azimuth, so to get a bearing down to the degree off of stars as well. It’s actually easier than you think. Marcus: That sounds really interesting. In addition to the workshop though you’re going to be also doing some product demos, or some sort of vendor exposure stuff as well. So give us a description of what you’ll be doing there and what people can expect. Mitch: Yes, sure. I’m also going to be a vendor there. I’m going to have my table set up, my tent, and I’m going to have my wares on sale. Whether it be wool blankets or stuff, all stuff that I designed. Wool blankets, native survival knives, I’m going to have a gambit there, I’m putting steel kits, trapping kits, just a lot of things that either I’ve put together myself or I contact very expert at their field. Like LT Wright makes my knives. I go to the best, and I give them my design, and then they ship them to me and then I have them on my store, and it’s all exclusive to my store. I’m going to be bringing some of that stuff with me, wool blankets, knives, things like that. Marcus: -and doing stuff like that. Mitch: Yes. Exactly. I’m going to have my carving rig with me. And probably going to have a couple spoons, things like that, to sell as well. During downtime I’ll be carving away, and hanging out, and chatting, and photo ops. Whatever you guys want to do, I’ll be there, we can talk and have a good little time. Marcus: Cool. That sounds really cool. I’m excited to see both your workshops and your vendor site. So I just want to close with thanking Mitch for inviting me to his camp, and looking forward to eating some lunch. And we hope that you join us at the New England Bushcraft Show. You can get your tickets through Eventbrite by just typing in the search box, “New England Bushcraft Show.” But also you can go to New England Bushcraft dot org. You can click on the website link. There’s a direct link to buy tickets. Actually over the next few weeks I’ll be loading up a whole bunch of blog posts, and FAQs, and other information about the show, and about the participants and everything that’s going on. So stay tuned. I hope you follow our YouTube channel. Certainly follow Mitch’s YouTube channel. And hope to see you on the April 28th at the New England Bushcraft Show.